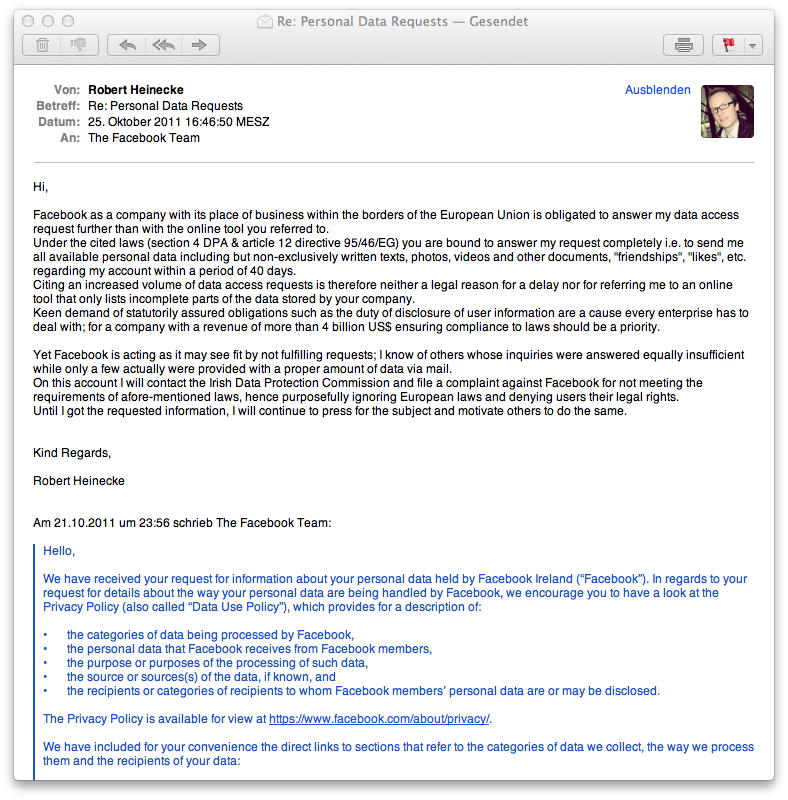 Facebook as a company with its place of business within the borders of the European Union is obligated to answer my data access request further than with the online tool you referred to. Under the cited laws (section 4 DPA & article 12 directive 95/46/EG) you are bound to answer my request completely i.e. to send me all available personal data including but non-exclusively written texts, photos, videos and other documents, „friendships“, „likes“, etc. regarding my account within a period of 40 days. Citing an increased volume of data access requests is therefore neither a legal reason for a delay nor for referring me to an online tool that only lists incomplete parts of the data stored by your company. Keen demand of statutorily assured obligations such as the duty of disclosure of user information are a cause every enterprise has to deal with; for a company with a revenue of more than 4 billion US$ ensuring compliance to laws should be a priority. Yet Facebook is acting as it may see fit by not fulfilling requests; I know of others whose inquiries were answered equally insufficient while only a few actually were provided with a proper amount of data via mail. On this account I will contact the Irish Data Protection Commission and file a complaint against Facebook for not meeting the requirements of afore-mentioned laws, hence purposefully ignoring European laws and denying users their legal rights. Until I got the requested information, I will continue to press for the subject and motivate others to do the same.